Skills Route PLAN can enhance your existing careers programme if it is integrated with other activities. It needs to be relevant and timely. Your year 11s will be considering their study options in the Autumn before making their sixth form applications in the Spring term. The Autumn term is the perfect time to get them to use Skills Route PLAN. For Year 10s, the Summer term is the best time to start looking forward to the decisions they will need to make in Year 11. •	What level of qualification should I be studying? •	What type of qualification can I study? •	What subjects am I interested in? Before introducing Skills Route PLAN (or any other tool) you should first introduce the landscape of options for after GCSEs. Many of our schools have chosen to do this in an assembly. We have a presentation here you can use to outline the options for post-16 study. To ensure that all your students complete Skills Route PLAN, you should have a dedicated session. This could be in an IT room so they can work through the tool at the same time. Or some schools have 1-2-1 sessions using a computer or iPad. The tool is simple to use and can be completed in a 30-minute session. It does require students to create a login. We suggest they use a consistent format such as forename.surname@schoolname.org. It doesn’t matter that the email address doesn’t exist; the tool requires an email format and the consistent format means that we can provide the output to you later (as part of a paid-for service) if you want it. Before the session, give your students a homework assignment to think through the inputs to Skills Route PLAN. This will ensure that they come prepared for the session. We have a template you can use here. At the end of Skills Route PLAN the student will get a summary of their PLAN as shown below. Students can print or email it. You should tell them who to email it to; either a careers lead, their form tutor or an admin email where they can be collated. Or we can collate it for you as part of a paid-for service. •	The student is interested in a specific career or university course. These tips should ensure you and your students get the most from using the free version of Skills Route PLAN with your Year 10s and 11s. As a paid for service we can provide you with aggregated data on your student summaries and a summary for each of your pupils. Your students will not need to email their summary to you because we will collate the information and send it to you. 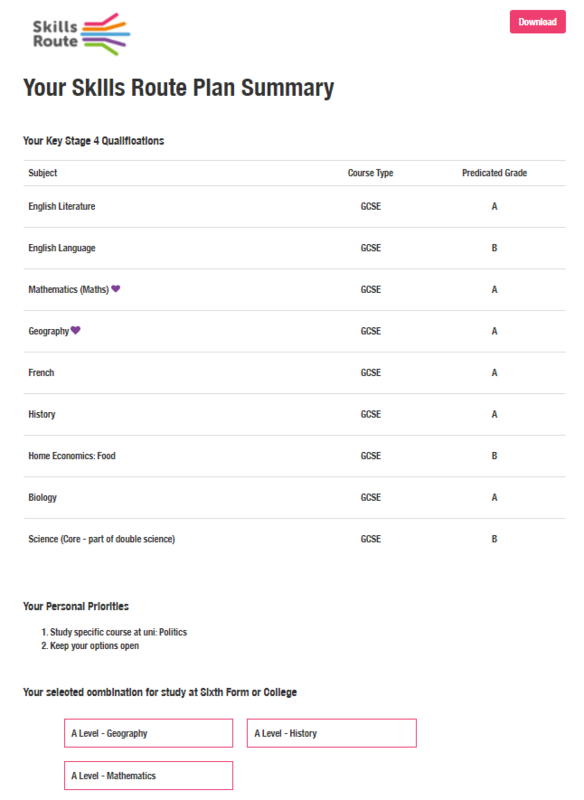 You will also get aggregated data on your students’ choices so that you can design your careers provision around the interests and abilities of your students. For a free walkthrough of the tool or to talk about how to use Skills Route in your school, please CONTACT US.